Floyd D. was a soldier in the 761st Tank Battalion, a segregated unit comprised of African-American men. His unit was present at the liberation of Gunskirchen, a subcamp of Mauthausen, and he witnessed the aftermath of its operations. Floyd spoke to students in the Bay Area for many years, sharing his experiences and the things he had seen. 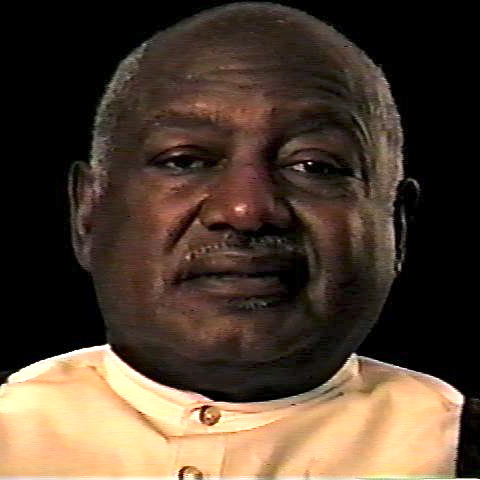 Floyd describes the impact of hate and prejudice, as well the strength he witnessed in the survivors. You just couldn’t believe what you were seeing. You didn’t think that anybody, a human being, could do that to another person. And also, you know that, it’s terrible, you just… And all of it came out of hate and prejudice, people not liking one another, people hating people that haven’t done anything to them. I just don’t see how a person could do that to another person. I thought the prejudice that we were having, the blacks in America, it was tough, but I’d never seen anything that bad. You know, sometimes it put you to thinking, just wonder, about the slave ships that they had the blacks coming over here on, when they had them chained and bound, and ones would die and they’d still be there, the stench and everything, in the bottom of these ships, and, you know, the people, their eyes were sunk in so far, so deep. And I don’t see today how some of those people survived. You can’t kill a person’s will, can you? I’m telling you, they had to be strong. I don’t understand, or couldn’t understand, why people would do that to another people. And, I don’t know how they sustained it, but, anyway, it gave me courage. If they could stand all of that humiliation, and being treated the way they were, and butchered the way that they were, experimented on, it made me a stronger person. That the little petty things that people try to do to you, to tick you off, just… They’re the ones that need help. Not you. And another man trying to tell another man that you’re not this, you’re not that, that I’m better than you are. He’s sick. We all are God’s creatures, and we’re all alike. Our skin may be different, our color may be different. That doesn’t give us the right to hate one another. We are all the same in the eyes of God. And it’s just hard for some people to know that, to believe it. Whoever say that it didn’t happen, I would like to tell them that it did, and I am a living witness to witness it. To me, it’s memories, and to the ones that wasn’t there, and now, it’s history. To them. So they gotta believe it. They must believe it, because if we don’t remember this, it’ll happen again.